1. Convert AVCHD MTS/M2TS to H.264 MOV with 16:9. 2. Convert MOV to AIC with the freeware MPEG Streamclip. 3. Edit AIC in FCE. However, after googling solutions online, I notice that I could easily convert AVCHD MTS/M2TS to AIC for easy editing in FCE. That means I could get into editing with only faster workflow. I downloaded and tried Aunsoft MTS/M2TS Converter for Mac to convert Sony CX550 .mts files, and it works great with the source footage and converts to Apple Intermediate codec for FCE without problem. 1. 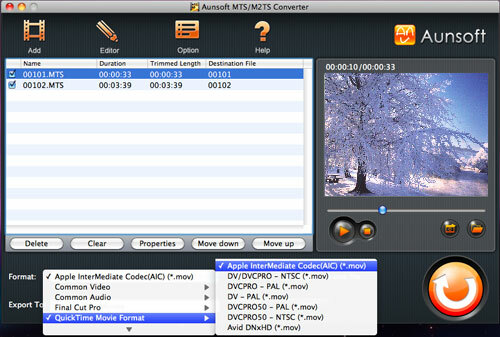 Convert AVHCHD to AIC with Aunsoft MTS/M2TS Converter for Mac, keeping 16:9. 2. Edit HD videos with AIC in FCE. Below is the screenshot of the Mac AVCHD to AIC converter for camcorders like Sony HDR-CX550, Panasonic HDC-TM700, Canon HF S21, etc. It saves time on HD editing while converting AVCHD to Apple Intermediate codec for FCE. If you are going to use the edited videos for web upload or sharing, you shall deinterlace Apple intermediate codec on Aunsoft MTS/M2TS Converter for Mac.